INC Review 2019: Is INC a Good Hosting? 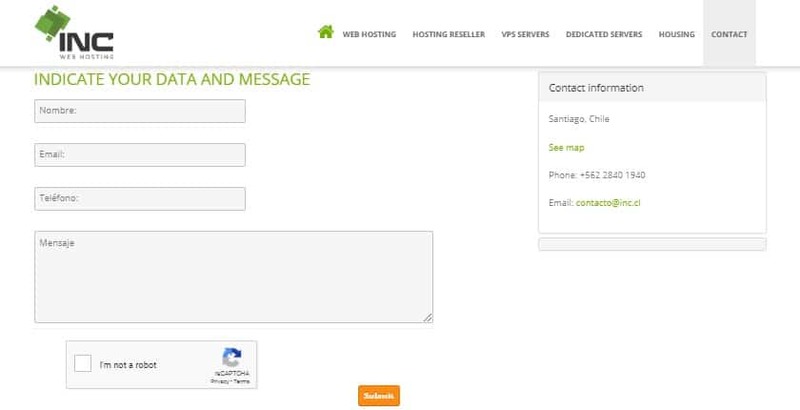 With over 10 years of hosting experience, Chile-based INC provides stable and affordable shared hosting, VPS, and dedicated servers in addition to domain registration services and SSL Certificates to over 3,000 customers with a portfolio of 12,000 websites combined. INC is a Chilean hosting company that provides reliable Linux web hosting and dedicated servers as well as VPS along with domain name registration, hosted email, and SSL. Fast and scalable, their 40+ servers are housed in a secure data center in Santiago which is manned by Spanish-speaking network engineers and hardware technicians.INC is a Chilean hosting company that provides reliable Linux web hosting and dedicated servers as well as VPS along with domain name registration, hosted email, and SSL. Fast and scalable, their 40+ servers are housed in a secure data center in Santiago which is manned by Spanish-speaking network engineers and hardware technicians. Once you sign up, you can build a mobile-ready website using their free RVSitebuilder tool and optimize it for search engines with their SEO kit. It comes with a range of professional templates that you can customize. With support for 29 languages and a friendly interface, it’s the perfect tool for non-techies who want to build and launch their websites quickly. Alternatively, you can build a CMS website or e-store by deploying any of the 50+ apps including Joomla and WordPress via Softaculous. cPanel is their choice platform for managing shared hosting accounts. Available in Spanish, this intuitive panel lets you manage your web space, emails, MySQL databases, and websites from a central place. It also comes with security features and stats to Resource Usage tool with a graph that shows CPU usage in real time. Using their step-by-step wizard, you can implement Google Apps on your account as well. Thanks to their automated backup system, users can focus on their business and worry less about data. They carry out daily, weekly, and monthly backups of your websites and emails and keep the backup data for 30 days. So, should you delete files accidentally, you can rollback your website to the last update point. Besides offering customers a 7-day free trial, INC has done a good job by keep the price of shared web hosting and dedicated servers within the reach of most Chileans. They have four packages with monthly, half-year, one-year, two-year, and three-year billing cycles. When you place an order, you’ll receive an electronic invoice and you can pay via WebPay Plus, Khipu, PayPal, and EFT. INC operates a private data center in Santiago, staffed by a Spanish-speaking technical support team. Their customers enjoy guaranteed resources and the best connectivity in addition to personalized support on a myriad of hosting issues. If you’re looking for answers to simple hosting issues, consult their video tutorials, FAQs, and knowledge base with “How-to “articles before you reach out to their technical support team via telephone or email. INC is worth considering if you’re looking for a reliable, Chilean hosting provider with a local data center and Spanish customer support team. Get Cheap SSD-powered hosting at INC! Wondering how INC stacks up against other Web Hosting companies? Enter any other Web Hosting company and we will give you a side-by-side comparison.